Software stocks currently fulfil two leadership criteria according to Cappelleri: i) They have recovered most from their lows and ii) They are the first group of stocks to make new highs. Looking at the IGV Software ETF, he notes that it made new highs three weeks ago, corrected and is now back again (see Chart). It is also up over 31% from its lows. 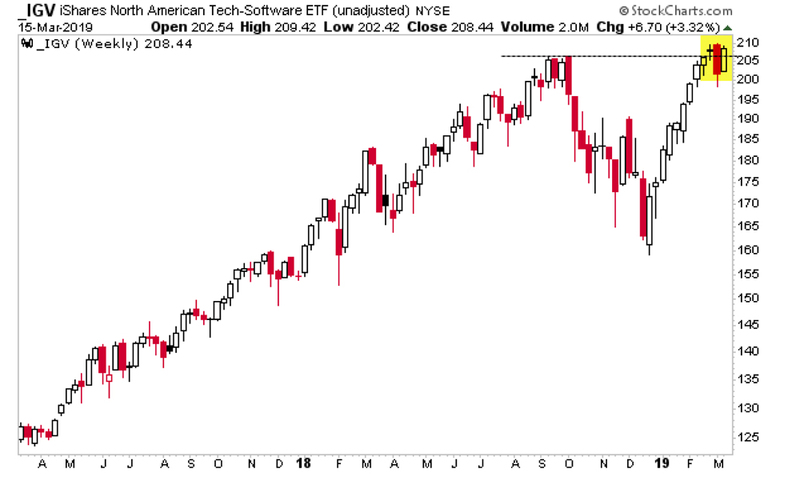 After regrouping for much of March, Cappelleri thinks the IGV Software ETF is ready to test its highs once again and seeing how it fares near a critical level – whether it breaks above or bounces off it – should tell us more about the strength of the US equity market in general. He therefore thinks the IGV ETF should be monitored closely.